This Papo Allosaurus has an articulated jaw that really opens and closes! The Papo Allosaurus measures approximately 10.5 inches. The word "Allosaurus" means "different lizard". The Allosaurus was a large predator dinosaur that walked on its hind legs. It's three-fingered upper arms were small and weak relative to its powerful hind legs. Its skull was large and equipped with dozens of sharp, serrated teeth. Its body was balanced by a long and heavily muscled tail. 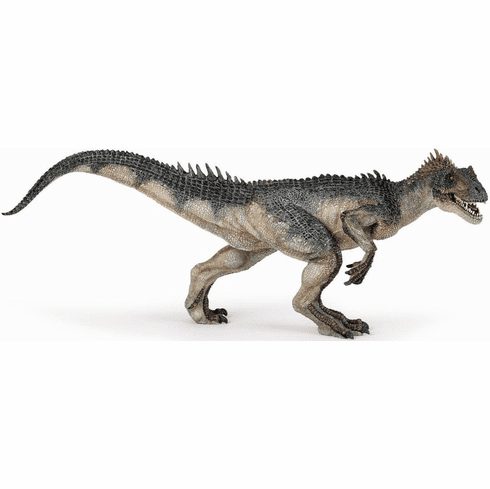 The Papo Allosaurus #55016 is part of the Dinosaur Series by Papo.